A week ago today, it was snowing. There was not a lot of snow, but it was falling. And today? Well, it's supposed to be 80 degrees. It's cliche but the old jsaying "don't like the weather? just wait a minute, it'll change" is true. So spring has sprung, maybe, hopefully. I'm ready to ditch the coats and turn off the heat. But am I ready for tank tops and shorts? I'm not so sure. The first time I put on shorts after a long winter, I feel naked, overexposed. I feel vulnerable, judgy. I feel too pale, too fat, too naked. But there's no hiding when it's going to be 80 degrees. 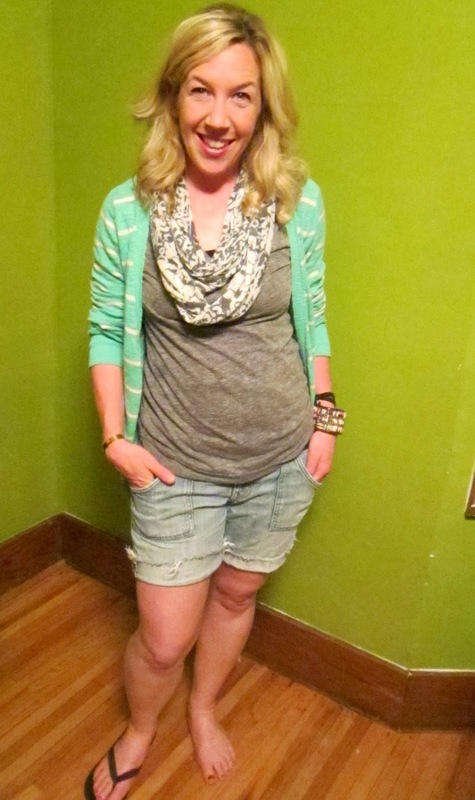 Instead of being afraid, I decided to have some fun with suddenly spring fashion and link up with the pleated poppy's what i wore wednesday (WIWW). Okay, this isn't naked at all. This is probably more appropriate for next week when the temp falls again. 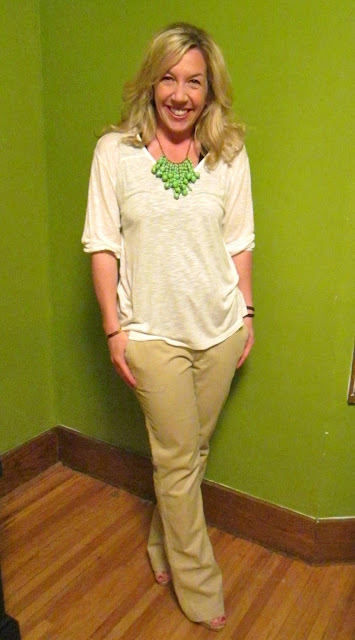 But these are summer khakis from Old Navy and a gauzy white-ish shirt also from Old Navy. The amazing necklace really springs the look up. I LOVE this necklace from 31 bits. I like to call this my Easy, Breezy Cover Girl look. Safe, comfortable and conservative--no nakedness. my puppy chewed up the other one. Acckkk, shorts! These are my comfy, 10-year-old cut-offs that are in my shorts comfort zone. Flattering? Mmmm, not so sure. But comfort wins for me these days. The t-shirt is from my favorite store Old Navy. The scarf is from Soybu and makes me feel a little more covered up and happy. I always wondered what kind of people wear scarves and shorts. In this instance it's an almost 40-year-old mama trying not to overexpose. I like to call this look my Jennifer Aniston. It's relaxed and a little hipster, but I think it says "I'm a pretty chill chick that's fun to hang with." This outfit just got even more comfort zone for me by adding the cardigan (from Target). This might be the winner to wear to my son's baseball game tonight. 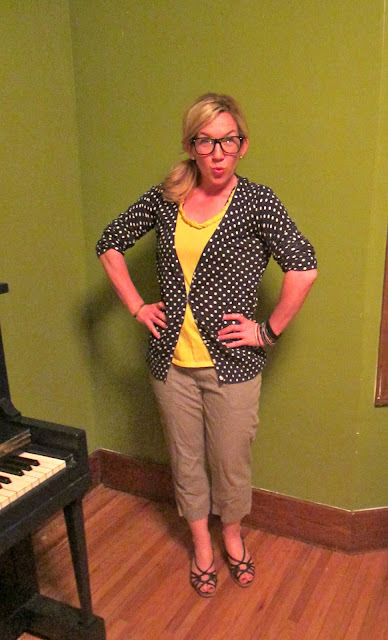 Polka dots, attitude glasses and a splash of yellow all make me happy. This is Old Navy head to ankle, the shoes are from Kohl's (12 years ago!). The yellow shirt and the pants are items I bought last summer. The attitude glasses are from Claire's. I like to call this look Funny Librarian. Just because I think it's funny. So yeah, it's suddenly spring and it's going to be 80 degrees. I think I can handle it and maybe even have fun with it. What are you wearing? What are your spring fashion must-haves? shorter capris and skirts all the way for me this spring/summer. i might even throw in a dress for fun, but shorts hardly ever make me feel good, unless they're bermudas...those knee length ones. +1 to the cardigans and shorts (or capris) for the warmer months. layers are never a bad idea. also, i need more statement necklaces. the end. 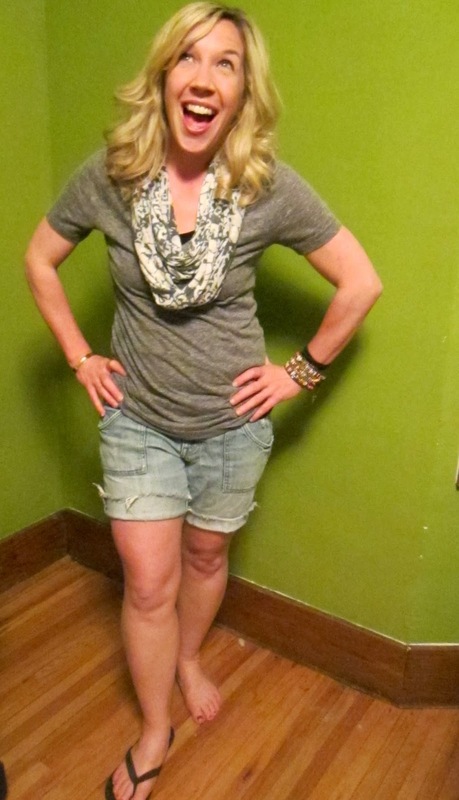 I 100% agree with your statement "shorts hardly ever make me feel good." Totally! I love your style! That green necklace and the target sweater are so cute and colorful. Thank you! I used to only wear black and grey, but once I started wearing more color I couldn't stop. It's so fun! The fact that you're wearing 10yo shorts is AMAZING to me. I have gone up and down so many sizes that it changes from season to season! Also, I have that gray v-neck and it is my FAVORITE SHIRT EVER. I bought a bunch in other colors, but i wear the gray more than any other. It looks super cute with the scarf and cardigan....totally stealing that! I've gone up and down over the years too--the shorts are all stretched out. During my thinner times I wear a belt and all the other times, no belt is needed. lol. Agree about the gray v-neck, I'm trying not to wear it everyday. Thank you Greta for reading and being so supportive!! !